Dear Willy, The True Story of a Life Well Lived is a real life biographic memoir penned by author Claire Ohlsson Geheb. Delving back into her own family history, Geheb explores the life and times of Willy Oswald Geheb, a German American immigrant who sought a better life for his family and his descendants, despite living through some of the most terrifying and difficult years in German history. Chronicling the period of both World Wars, the story begins with Willy’s training as a private in Germany. The life of the German people through war and in the inter-war period is tremendously difficult, and it’s only as the Second World War concludes that there is a tiny flicker of hope for a better future. Claire Ohlsson Geheb has done a wonderful job of chronicling her family history by collecting and collating letters, diaries and other documents to bring Willy Geheb’s original life story into brand new being. I am a huge fan of real life stories of families living through the Second World War, and the tale of the Gehebs brings all the terrifying drama and fear to the fore whilst also showing their solidarity and spirit. They never stop dreaming of more, and that also makes this a fascinating tale of immigration success, one with extreme heart and consideration for the hardships of others. 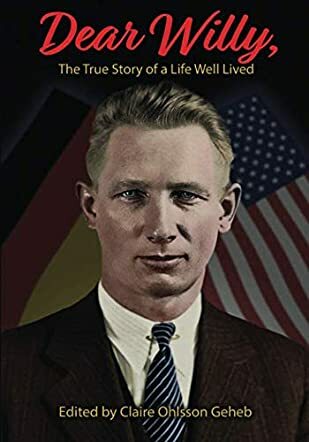 History fans will delight in real photographs and ‘at the time’ evidence from Willy himself, and overall I’d say that Dear Willy, The True Story of a Life Well Lived is a real triumph.